Hondurans TPS (Temporary Protected Status) in the U.S. was cancelled earlier this month but the war of words and disinformation is just starting. Even though TPS is meant to be exactly what it sounds like, we learned from DACA that temporary means different things to different parties. TPS for Hondurans lasted twenty years, but even two decades of temporary isn’t long enough to please everyone. That got the ball rolling when Bill Clinton was president. The problem now is that no Central American country will be judged able to handle the return of its residents no matter the circumstances whether they are temporary or outright illegal. Just like ending DACA, the political cost to Democrats is too high. We do the best we can, but this isn’t a problem for taxpayers. Nevertheless, after twenty years of keeping these people safe from the ravages of a hurricane the White House is under attack because the Trump Administration decided temporary should mean exactly that. 18 months not long enough? To a reasonable person the administration’s plan to bring Hondurans TPS Protection to an end sounds plenty fair and reasonable. Stable and secure is a lost cause, but Caucus Chair Lujan Grisham (D-NM) is right about one thing. Bringing Central America to the U.S. will make life more stable and secure for anyone who makes the trip. That doesn’t make it good for us, though it will be another feather in Democratic caps. Democrats call the new policy “misguided,” “hateful,” and “anti-immigrant” 10 because in their world “temporary” means a political foot in the door that lasts forever, like DACA. What’s absolutely false is the claim that we are mass deporting Hondurans. Deportation is a legal term, not just a partisan dirty word. It means removing a foreigner because they violated the law. The benefit is preserving some semblance of the rule of law and the trust of America’s citizens that the government will follow through on what it promises. Like temporary, the rule of law also means different things to different politicians. Stripping residents of their legal status is closer to the truth than what we heard from Rep. Crowley, though mass deportation probably plays better for party members. It’s not as if we expected a thank you after twenty years from a party that’s determined to force U.S. taxpayers to be responsible for whatever ails the world so members can take credit and dump the burden on the rest of the country. We have a proud history of providing humanitarian assistance and offering refuge. Democrats will continue to push the envelope and spread disinformation about U.S. immigration policy no matter what it does to our well-deserved reputation for lending a helping hand to legal immigrants and temporary residents. 1. “Temporary Protected Status.” U.S. Citizenship and Immigration Services. https://www.uscis.gov/humanitarian/temporary-protected-status, retrieved May 31, 2018. 2. “Designation of Honduras Under Temporary Protect Status [64 FR 524] [FR 1-99].” U.S. Citizenship and Immigration Services. https://www.uscis.gov/ilink/docView/FR/HTML/FR/0-0-0-1/0-0-0-54070/0-0-0-54088/0-0-0-54563.html, retrieved May 15, 2018. 3. “Reps. Jimmy Gomez, Norma Torres, and Jim McGovern Call on Trump Administration to Renew Temporary Protected Status for Honduras.” Jimmy Gomez. May 1, 2018. https://gomez.house.gov/news/documentsingle.aspx?DocumentID=284, retrieved May 14, 2018. 7. “Reps. Jimmy Gomez, Norma Torres, and Jim McGovern Call on Trump Administration to Renew Temporary Protected Status for Honduras.” Jimmy Gomez. Op. cit. 8. ‘Secretary of Homeland Security Kirstjen M. Nielsen Announcement on Temporary Protected Status for Honduras.” Homeland Security. May 4, 2018. https://www.dhs.gov/news/2018/05/04/secretary-homeland-security-kirstjen-m-nielsen-announcement-temporary-protected, retrieved May 10, 2018. 9. “CHC Chair Statement on Termination of TPS Status for 57,000 Hondurans.” Congressional Hispanic Caucus. May 4, 2018. https://congressionalhispaniccaucus-lujangrisham.house.gov/media-center/press-releases/chc-chair-statement-on-termination-of-tps-status-for-57000-hondurans, retrieved May 13, 2018. 10. “Chairman Crowley Statement on the Trump Administration’s Mass Deportation of Hondurans.” Dems.gov. May 4, 2018. https://www.dems.gov/newsroom/press-release/, retrieved May 7, 2018. 13. “Nadler & Lofgren Statement On Trump Administration Decision to End Temporary Protected Status For Hondurans.” Zoe Lofgren. May 7, 2018. https://lofgren.house.gov/media/press-releases/nadler-lofgren-statement-trump-administration-decision-end-temporary-protected, retrieved May 15, 2018. 14. “Rep. Jimmy Gomez Denounces Trump Administration Decision to End Temporary Protected Status (TPS) for Honduras.” Jimmy Gomez. May 4, 2018. https://gomez.house.gov/news/documentsingle.aspx?DocumentID=286, retrieved May 15, 2018. Image: Larson, Debbie, NWS, International Archives. 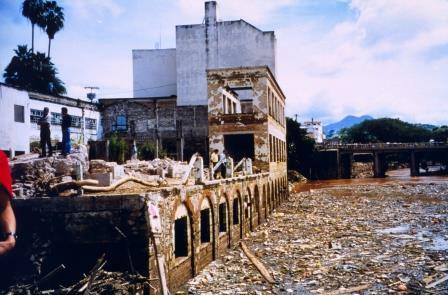 Flood damage along the Choluteca River caused by Hurricane Mitch. National Oceanic and Atmospheric Administration/Department of Commerce. Retrieved from http://www.photolib.noaa.gov/htmls/wea02441.htm on May 15, 2018.